Mandy is a girl who has always wanted her own horse ad her biggest dream comes true whenever she turns thirteen. Her dad, who is a vet, gets her a brand new horse of a rare breed, Psao Fino, named Solana. She and her best friend Laura have been friends since the third grade but whenever Mandy finally gets her horse, Laura isn't very supportive. She picks everything wrong with Solana and seems to be jealous. Laura even starts acting really mean towards Mandy especially when a new boy named David shows up and helps Laura's family out during the summers while he's away with his uncle. Laura and Mandy both have a crush on David but whenever David starts to choose Laura, Mandy gets mad. Despite the fact that David seems to be choosing Laura over Mandy, Mandy is still nice to Laura and concentrates on training her horse. 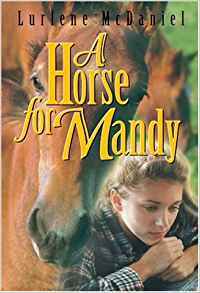 Things become pretty intense, as Mandy's horse named Solana starts having problems in her leg and her father diagnoses it as being Flounder, which is a strange condition in horses, sort of like Arthritis. Mandy becomes deeply hurt and tries to think of ways to help keep Solana alive. Laura says something really mean to Mandy and so Mandy finally snaps at Laura and tells her to quit acting so mean. Then Laura says even more awful things and cries. Next thing you know, Laura's parents come by with the news that Laura has run away and she took her horse Diablo with her. Mandy soon starts getting worried about what she can do to help find Laura. Her father suggests she stay at home while they take care of the search. Will they find Laura? Will she be so mean towards Mandy still and what will become of Solana? I have read the book already and know these answers but I won't spoil it for those who haven't. Please read this amazing book to find out! I have this book and i have read it in half an hour and all horse lovers should read this book. Love it even though its a little short! I LOVE THAT BOOK!!!! Its pretty short though. I read it in about two hours. But it's great. I recommend it to any horse lover!